We often have rice for dinner and almost always have some leftover. If we don't have plans for the leftover rice for lunch or dinner the next day, I like to use it for breakfast. Sometimes I go sweet with my rice pudding but sometimes a savory, spicy breakfast is just what I'm in the mood for. This recipe can be whatever you want it to be so the ingredients below are just a guide. I usually grab the veggies from the fridge that need to be used up and sometimes add a bunch and other times just a small amount. Also, if you like things spicy, you can add more Sriracha sauce or you can nix it all together. I use fish sauce in this recipe which you can find in the international section of most grocery stores. I personally HATE the smell of fish sauce but love the salty flavor it adds to the dish. If you're like me and think you've ruined a dish the second you add it, just have faith ... it will taste amazing when you're done! Heat half of the oil in a skillet over medium high heat. Add the garlic and cook until fragrant (about 20 sec). Add the onion and pepper and cook until the onions are translucent and slightly golden. Add the kale and cook until it is wilted, about 2 min. Add the rice, fish sauce, lime juice and Sriracha sauce and stir to combine. Continue to stir until the rice is heated through. Move the rice from the skillet to a bowl and add the rest of the oil to the skillet. Crack the eggs and cook to your preference (I like over hard but sometimes feel like having over easy) adding salt and pepper to taste. 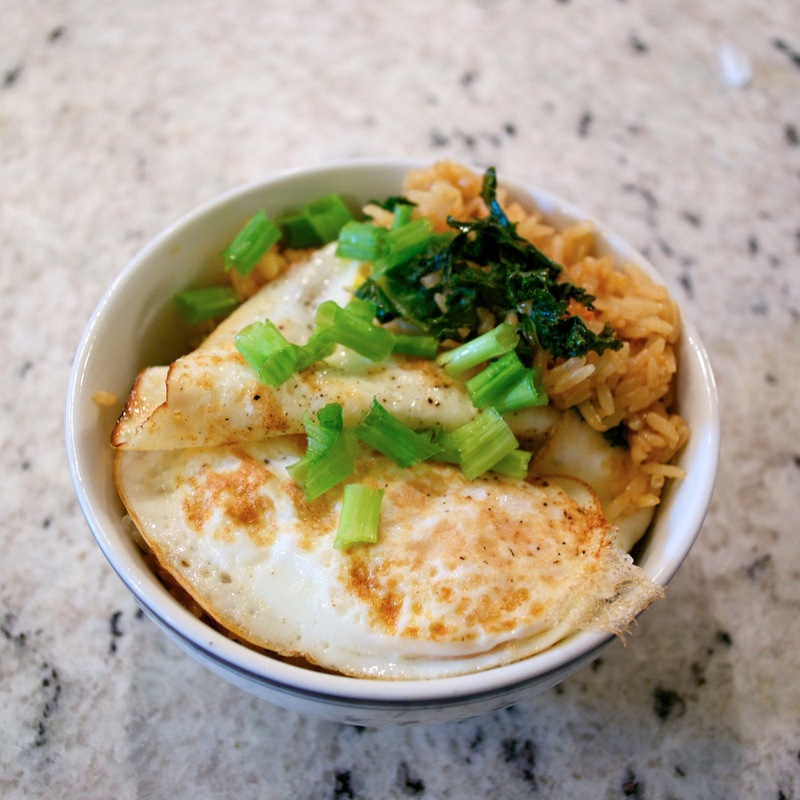 Slide the eggs on top of the rice and top with the scallions. Grab a cup of coffee (or tea if you're me) and Enjoy!